The universe is filled with high-energy radiation, much of which is made of gamma rays belched out by strange pulsing stars and the remnants of supernova explosions. But a new study of some of most extreme objects has turned up a mystery: nearly one-third of all gamma-ray emitting objects seen to date defy identification. The objects were spotted by NASA's Fermi Gamma-ray Space Telescope, which scans the entire sky over the course of three hours, mapping the powerful spectrum. When stacked together, the surveys create an extremely precise view of the gamma-ray universe. Scientists then match these images to other observations to identify each source. But the identities of some gamma-ray sources in space still continue to elude the astronomers. 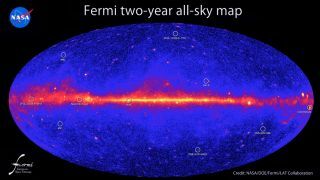 The Fermi space telescope has spotted nearly 500 powerful gamma-ray sources in deep space over the last three years. Before its launch in 2008, scientists only knew of four such objects. "We're not looking for the ordinary things," Thompson said. "We're looking for the extraordinary; powerful things that might produce gamma rays." Of the newly discovered bodies, more than half are active galaxies. Pulsars and supernova remnants each make up about 5 percent of the sources, with high-mass binary stars and other galaxies contributing just a smidge more, the researchers said. Yet a large collection of objects remains unidentified, they added. In some cases, the readings themselves helped scientists to classify the sources. By looking for changes in energy levels or studying the objects' shapes, astronomers could identify pulsars and galaxies. But gamma-ray targets without these distinctions remain a mystery. In many cases, the problem may simply be one of not enough data. "Deeper observations at other wavelengths could find counterparts to some Fermi sources in the future," Pascal Fortin, at the Ecole Polytechnique's Laboratoire Leprince-Ringuet in France, told SPACE.com in an email. Fortin was one of the leaders of the international team that produced Fermi's hard-source list. Despite their mysterious origins, the sheer number of unidentified sources is promising. "The fact that there are so many of these suggests to us — maybe this is wishful thinking — that there may indeed be something new out there," Thompson said. "What we'd really like to find is something new and exotic." One potential cause of the baffling readings could be black holes that are interacting in a new and unexpected way, he added. If the strange objects reveal nothing else, they highlight how much of space is still a mystery. "We still have a lot to learn about high-energy processes in the universe," Fortin said. Over its decade-long mission, Fermi will continue to gather information about the gamma-ray emitters, and may help answer some of the questions it is creating. "It's an exciting field to work in," Thompson said. "The fact that we have so many of these, I think is very promising in terms of future discoveries."